The first day of fall. It sneaked up on us behind weeks of dry weather, bluebird skies, and a summer of warmth and sun. With the distraction of so many bright wild sea run Cutthroat trout caught from the beaches since spring, and the enduring weeks of good Coho fishing having continued through September, we have been busy living like beach bums, too busy to think about fall. This summer was especially dry and warm here, and all summer the rivers have drawn down to their bones as the last of the winter snows have melted to a trickle. All of my attention has been on the Salt chuck. The combination of warm sunny weather, and shallow wading in cold waters, is thoroughly refreshing. And just enough fishing surprises along the way to keep me excited about each day on the beaches. You may have an idea of how it is going, with the bait and the fish, and the fishing. But as they say, "Mother Nature always bats last". And often she hits us a home run. So when the leaves begin to curl, and the mornings come a little later, and the evenings begin to chill, and the wood smoke wafts in the air, I begin to get a hint that things are changing again. And all through September a kind of anticipation builds. Fall has always been my favorite season for as long as I can remember. And here on the Olympic Peninsula it seems that this great annual turning of things brings a kind of rush of opportunities for us, and we are often hard put to know which way to go first in our fly fishing adventures. Of course when it comes to fresh waters, and river fishing, September and October here have to be among the best months for Cutthroat trout and Summer Steelhead fishing, even during times of low water. The bigger glacially influenced rivers are clearing up in these scant flows, and that means there is dry line fishing to be had there finally. Termites, Caddis, Beetles, Stimulators, waking flies, all viable options for skating across the surface of a glassy run at dawn or dusk. For some the more accessible lowland lakes are still a focus, as the evenings lengthen and the waters cool, and those fish go on an energetic feed in the last light of summer. This is also true of the higher elevation lakes, and this time of year one could camp and fish with almost no one else on the trails. Personally I best like hiking and camping here after labor day. Sometimes you can have an entire campground to yourself for days. The Autumnal Equinox still steers me straight for the saltwater beaches though. Once we get a nice punch of rain out on the west end rivers and streams, and the flows spike up a bit, then will resume more regular visits to those waters. But the Coho salmon are still coming, the sea run Cutthroat Trout have been feeding for months on bait fish and other forage, and they are as fat as they are going to be by the end of October. Some of the biggest, hardest fighting fish of the year are the autumn Cutthroat on the beaches. 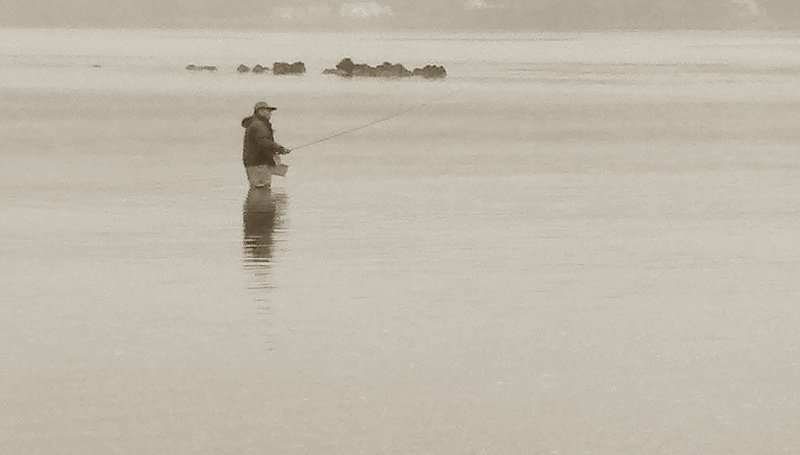 And now would not be the time to eschew dry fly fishing either. Just because these wild fish spend a few months in the salt chuck does not mean that they have forgotten the value of feeding on insects. September brings some very big hatches of termites out of the woods along our shores, and skittering a big rusty colored Stimulator, maybe a size six or eight, on a nine foot tapered leader, along the edges of the shoreline could be your ticket to a dream fish. These trout are on the feed this time of year, and a fly that is active on or in the water will get the most attention. 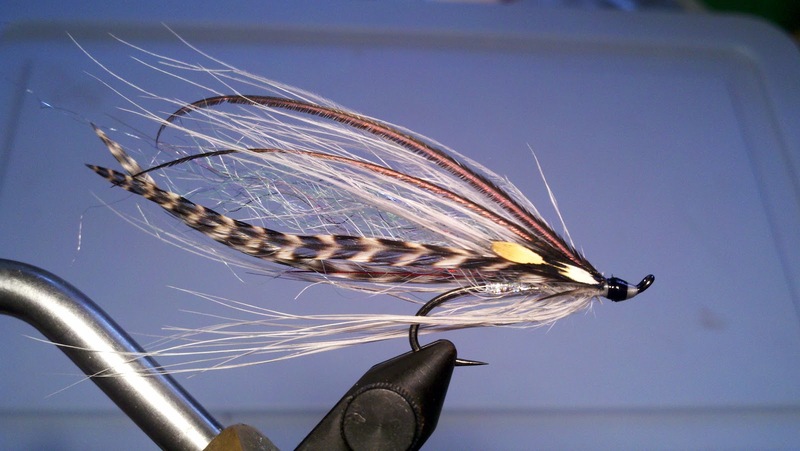 Even using a wet fly or streamer I will give the fly "pulses" of movement through a swing. And I will change up my presentations often. Using everything from dry flies to poppers to streamers in the course of a day is a strong tactic. 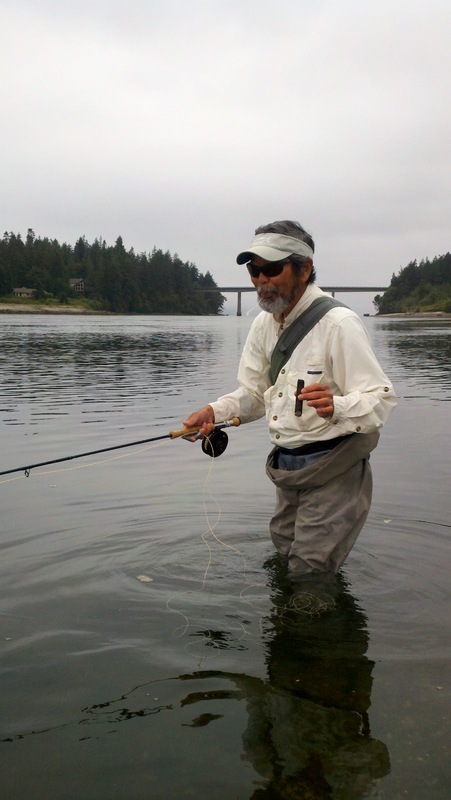 Speaking of poppers, you have to try fishing with Leland Miyawaki's Beach Popper. This is a thoroughly fun and addictive approach, and once you get a few fish on this fly you will want to fish it all of the time! Having Coho around means that there is always a chance that your fly could get grabbed by something bigger than you had planned for. Most of the salmon that we do catch are caught coincidentally to sea run fishing, on trout flies and leaders, and a few of them do get away unscathed aside from having a piece of fly fishing jewelry in their jaw. A good example of the real sense of seasonal changes came this week with cool, cloudy, foggy weather moving across the Puget Sound region on a wind shifting from the south and west. This morning was drizzly wet, misting all morning, grey and overcast, and foggy. The visibility was around one mile at best all morning, and barely lifted until late in the day. One thing I like is overcast weather when I am fishing. We had trout and Coho salmon jumping in front of us on and off all day. All of this moisture, coming off of the Pacific Ocean, is but a harbinger of what is to come over the next few months. Once the summer wind patterns shift from northwest to southerlies, that is the real game changer. And this year it is right on time. We may get weeks of mild weather ahead. And we sometimes do not get significant rains until well into late October or almost certainly by November. But it is a done deal that we will be getting cooler and wetter here for some time to come. I always find this to be a refreshing time, and an exciting time. Because I know that someone is going to catch a few big strong Cutthroat this time of year- And by November there are Steelhead in the mix on some of our beaches- and I won't mind a bit if it turns out to be me. So I dress with another layer, and a warmer hat too. I make sure my camp stove is ready for hot tea anytime, and I keep on tying sea run Cutthroat flies right through Thanksgiving time some years. This is the propitious moment. This is my fly pattern that Keith caught his beautiful autumn Cutthroat on: "Little Stone's Beach Baby"